Matt and Glynnis were in the midst of a pilgrimage when Z and I met them. Beginning in Georgia, they made their way to Miami before eventually landing in Louisville for a four year layover. There was never a question of if they would move to Napa it was merely a matter of when. I was sad to see them leave but inspired by their innate sense of going home… home to somewhere they had only visited but knew was their intended place. The fringe benefit is that we now have a home-base in downtown Napa and Matt and Glynnis welcomed us with open arms this past February as we made our annual journey to the Valley. It’s beautiful to see how their roots in Napa have grown and they are now a vibrant part of the framework of this idyllic community. We love tagging along in their dreamland, if only for a few days, and the itinerary of our visits has always remained the same – tour the vineyards all day Friday, Saturday and Sunday, spoiling ourselves rotten and dining unabashedly each evening on the locally grown goodness. This trip however would offer a detour as we came to California with the specific intention of attending the Flora Springs Trilogy Release Party. Matt and Glynnis had been building up this event to us for years and I was not at all surprised when it proved to be even better than expected. It was the high point of a weekend filled with wine, cheese, Model Bakery English muffins, wine, brioche stuffed chicken, pizza, wine, curried cauliflower, hand-rolled mozzarella, wine, paella and more wine. It was a blissful weekend and we are always pleased and thankful to be a piece of a chapter from the storybook of Matt and Glynnis. Z and I set off on the hour long drive from San Francisco to Napa after a whirlwind 48 hour exploration of the city by the bay. We reunited with Matt and Glynnis and, per my request, headed straight for Model Bakery, where they make the most phenomenal English muffins. There are two Model Bakery locations, one on Main Street in St Helena and the other situated just outside of Oxbow Market. Oxbow Market is a beautiful example of a modern version of a historic tradition. A place for local food purveyors to sell their wares, fresh seafood, local meats, handmade pastries and breads are intertwined with a rainbow of bulk spices, a bevy of kitchen and dining accessories and an impressive selection of artisan cheese. It is a must-stop for the makings of a picnic lunch, a quick breakfast prior to hitting the wine trail or for a simple stroll, taking in the sights, smells and sounds of this California bazaar. Happily fortified, we made our way to Plumpjack, our first winery stop of the day. A sister winery to Cade (read about our previous visit to Cade here), Plumpjack is known for their expertly crafted Cabernet Sauvignon, Chardonnay, Merlot and Syrah. Matt had arranged for us to meet with Aaron Miller and Brett Brockmeyer, the Head Winemaker and Assistant Winemaker for Plumpjack, who he and Glynnis have the pleasure of calling their friends. We got to know one another in the tasting room while sipping on their Chardonnay, a beautifully balanced and elegantly crafted wine, bringing out pear and green apple notes with an undercurrent of oak and lemony acid rounding out the palate. We tasted through their current offerings and then took a stroll into their barrel room, large oak vessels stacked in neat and high rows, a sight of which I will never tire. Aaron and Brett were generous enough to give us samples of what they were working on, harvests from previous years yielding unique results based on the climate the grapes were subjected to during their growth. It will come as a surprise to no one that there are great things to come from Plumpjack. We were grateful for a preview and for the generous hospitality shown to us by Aaron and Brett. Neyers Vineyard and Ehlers Estate were next on our tour of the Valley. Neyers boasts an impressive variety of wine for their small, well regarded estate. We sampled a multitude and found each bottle to be elegant, approachable and of excellent value for the price. Ehlers also shines amid their limited production and this was ever apparent as they only had two bottles for us to taste upon arrival. Everything else had been bought up almost as soon as it was released. Their One Twenty Over Eighty was a standout, the name paying homage to the proprietor’s dedication to cardiovascular research. It is a beautiful example of a Bordeaux-inspired California Cabernet and Z and I were excited to pick up a bottle for our small but growing cellar. As we departed Ehlers, the sun was beginning to drop and we were all feeling happily hungry. A table was waiting for us at Torc, a newly opened downtown Napa hotspot that had received high praise from nearly the moment they opened their doors. Lofted ceilings enclose an expansive space with a galley-style exposed kitchen lining the back wall. A low hum emanates from the culinary crew as they fire dishes that have California roots and global inspiration. Flavors of Morocco, Italy and India make themselves known in the spicy marinated olives, the creamy coconut rice and in the delicate perfection of their handmade pasta and gnocchi. The seasonal menu rotates but always boasts the signature roast chicken for two, which Matt was gracious enough to share with me. Paired that evening with baby bok choy and the aforementioned creamy coconut rice, a thin layer of house-made brioche bread was placed carefully between the meat of the chicken and the skin, crisping under the hot flame, soaking up the juices from the bird all the while. It took a couple of bites to grasp the full complexity of this creative genius. 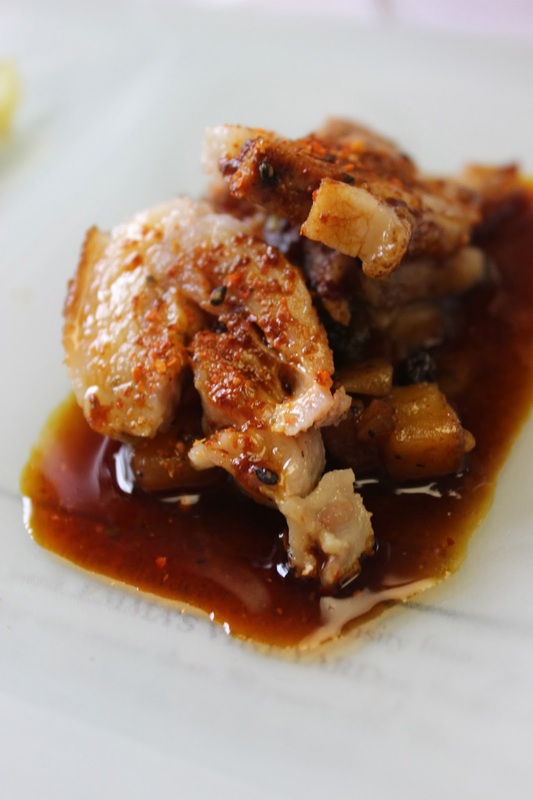 The sweetness of the rice was a wonderful offset to the umami nature of the bok choy, and the entire experience was highlighted by the perfectly roasted chicken, the rich brioche adding a stuffing-like quality to the meal. Simply put, this is not your average restaurant chicken. This dish, in fact, is not average in any way… an ideal fit for our not-so-average weekend in Napa. We awoke the next morning to a vibrant and beautiful day, the temperature slowly climbing as the sun rose high into the sky. Today would be dedicated entirely to Flora Springs and I wouldn’t have had it any other way. Our friends Becca and Joe would be joining us for the day’s activities and I couldn’t wait to see them. I was also happy to meet Kit and Eddie, Matt and Glynnis’s friends who arrived just in time to hop in the limo with us as we were whisked off to the sweeping vineyards of Flora Springs. Wine release parties are a common occurrence and wineries never miss an opportunity to celebrate the love and labor that was poured into one particular, often signature, wine. For Flora Springs that wine is Trilogy and they spare no expense when honoring this cabernet blend. A long, vineyard-lined drive takes you to the Flora Springs estate, a must-stop for any Napa Valley itinerary in my opinion (by appointment only, so plan ahead). You will be hard pressed to find a more open and kind crew than those who are a part of the Flora Springs Team and they have made us feel more than welcome, time after time. We were quickly given a glass of Chardonnay as they directed us into their hillside caves. A wide and open tunnel of sorts, we strolled past row upon row of barrels, snacking on freshly shucked oysters that were handed to us along the way. Turning the corner, there was literally a light at the end of the tunnel. The sun pouring in we emerged from the wine caves to a raucous crowd, a New Orleans inspired band jamming away as dozens of people buzzed about a beautiful and green courtyard that sat above the vineyards. A beautiful view of the Napa horizon laid out before us and my senses were pulled in a hundred different directions. I had no idea where to begin. A massive paella pan was filled to the brim with clams, sausage, saffron and crispy, perfectly burnt rice. From a steaming pot of water emerged a large ball of freshly crafted mozzarella cheese, a chef carefully drizzling California olive oil over top after laying the cheese on a crispy baguette and sprinkling it with large flakes of sea salt. Tiny meatball sliders packed with rich tomato goodness were being swiped up almost as soon as they were set out. In between it all, notes of peppery black fruit tugged at my nose, the 2011 Trilogy making itself known. We traded out our Chardonnay for a healthy sample of the Trilogy and set off to immerse ourselves in this wine wonderland. Amongst the paella, mozzarella and meatballs I immediately spotted thin, lightly charred slices of pizza, steam whispering off of the top of the just-melted cheese. Now I knew exactly where to begin. Over the next three hours we noshed on these offerings and many others all while savoring the flavorful and elegant craftsmanship of the 2011 Trilogy (and a variety of other Flora Springs creations). Our dining was interrupted by a sudden flash mob performance and a surprise visit from the University of California marching band. The energy of the day was ample and oh-so comfortable and I could have stayed for days on end, whiling away in this little piece of heaven. Eventually it was time to journey on however, and we piled back into our limo, singing at the top of our lungs as we headed to Jessup Cellars to wind down while sampling their beautiful pinot noir. Our perfect day was capped off with a cookout and – you guessed it – more wine by the fire pit back at Matt and Glynnis’s house. It’s a luxury to feel that contented and I did not take any part of the experience for granted. Day three is always my favorite during our Napa visits. There is a sense of relaxation and calm in us all, two days of full-living having come to a head, setting the stage for a peaceful day of exploration and enjoyment. Traces of a hangover pull at your senses but are quickly banished with more good food and even better wine. I sort of float through our Sundays in Napa, wrapped in a happy state of contemplation and serenity. Everything just feels right. As we set out that Sunday morning there was a sense of relief and hopefulness in the air, a light mist dropping from the clouds. In desperate need of rain, any precipitation, no matter how minimal, was welcome. We planned to spend the day in Sonoma and made the scenic drive amidst the raindrops, arriving at Scribe after traversing a long road lined with tall, skinny palm trees. A stone building set with strong wooden beams sits atop a hill overlooking the valley floor. With pinot noir as their anchor, the golden-grape of Sonoma, Scribe has branched out beyond this beautifully structured red wine and is playing with a variety of lesser-known offerings for this region. We sipped on their beyond-bone-dry riesling, the strong acidity tempered by a pleasant minerality. Next up was their chardonnay, my favorite wine of the day and one of the best chardonnays I’ve had to date. It was delicate on the palate, taking it’s time to open up and show it’s full complexity which is ripe with green apples, lemons and a delicate viscosity. Scribe helped us shake off any adverse remnants from the previous days’ fun and we moved on to The Reserve Room at Mayo Family Winery. Mayo takes a special interest in pairing their wine with food and they offer a seven course tasting experience that is without question the best value in the Sonoma Valley. A mere $35 will buy you a dining experience where the food is crafted to fit the nuances of the wine, rather than the wine chosen to highlight the food. A multitude of elements play a part in a wine’s end result, one of the biggest factors being the climate during the grapes growth. These individual elements were picked apart in each wine we tasted, the flavors of the food put in place to specifically balance out any misgivings in the wine. 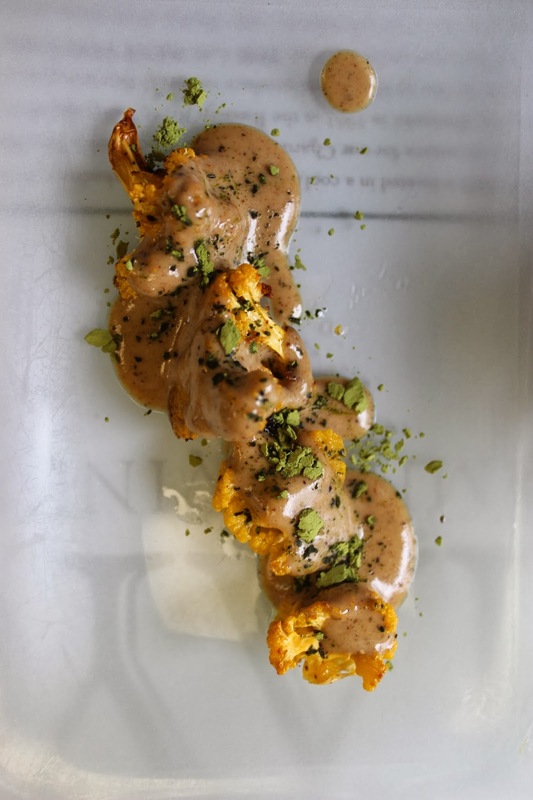 Chef Clayton Lewis walked us through the extensive thought process that went into every dish, telling us why, after tasting Mayo’s 2011 Viognier, he chose to top char-roasted cauliflower with a herbacious sauce of Moroccan Ras al Hanout spices and finely ground matcha tea. His riff on the traditional Provencal bouillabaisse was an ideal companion for the boldness of the 2012 Mayo Reserve Chardonnay, the foamed broth of the fish stew just briny enough to cut through the viscosity of this creamy California Chardonnay. The courses continued, each one creative and forward thinking, impressive on their own but truly meant to be enjoyed with their better half – the wine. My favorite course was a decadent offering of braised beef tongue and cheek, the tender richness of these lush ingredients cut in half by the jam-like qualities of the 2010 Reserve Zinfandel. What the Mayo Family Reserve Tasting room lacks in view and setting it makes up for in the bold flavors being brought forth from the kitchen and the vast variety of wine being poured. It was a wonderful way to spend our Sonoma day. The rest of the afternoon lacked a schedule and we were free to wander and meander in between the precious raindrops that were falling upon the parched vineyards. We toasted our last night and the end of yet another trip to remember over pizza and pasta at Oenotri, a casual and warm establishment in the heart of downtown Napa. Steaming pizza pies and hot bowls of handmade pasta filled our table and I cherished the far-too-rare feeling of total contentment. 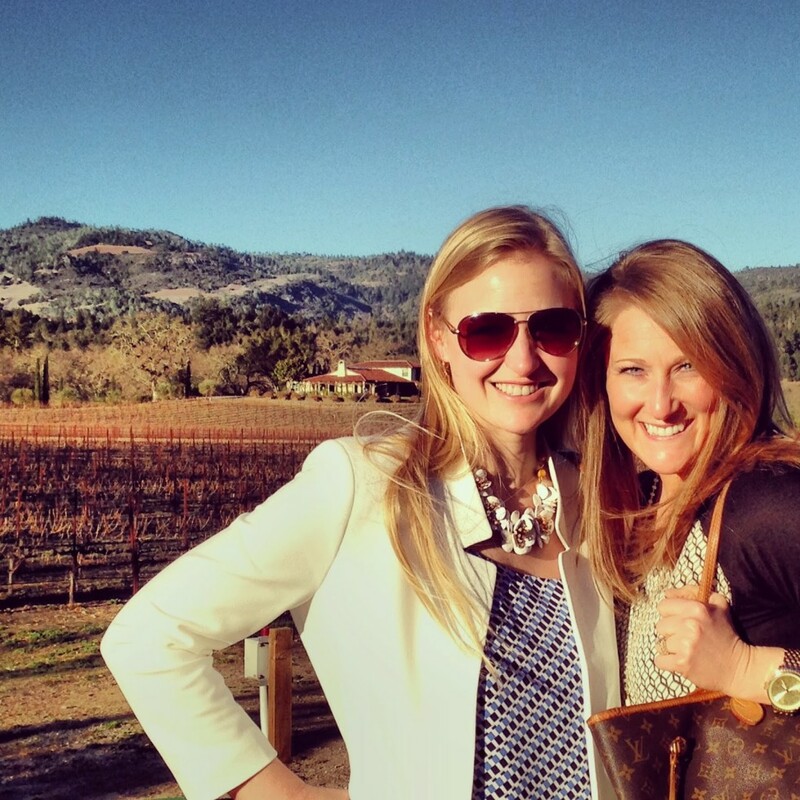 When I tell people that some of our best friends live in Napa Valley their reaction is always the same – ‘Wow, lucky them!’ And while they will be the first to tell you that they are very lucky, I will emphasize that much of this luck is self-made. They realized a dream and saw it through, making a move that honors the adage ‘live life to the fullest.’ This inspiration is not lost on me and Z and we are doing everything possible to keep our sights set on fulfilling our dreams. If part of that fulfillment is an annual pilgrimage to the valley then so be it. We’ll see you next year.